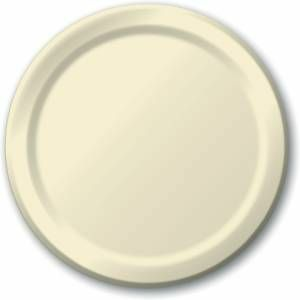 Ivory 7" Salad / Dessert Paper Plate 16ct. Ivory Lunch Napkins Paper 20ct. Ivory Guest Towel Napkins Paper 24ct. Ivory 9oz. Hot / Cold Paper Cup 25ct. $1 Ivory Plastic Forks, Spoons & Knives Cutlery 24ct.